Four pounds of Habbersett. Philadelphia's favorite scrapple. Keep some out for immediate use and put the rest in your freezer; it has a long freezer life. Please note that all of our prices INCLUDE SHIPPING. Choose from all Habbersett Scrapple, all Taylor Pork Roll or a combo package. Please note that all of our prices INCLUDE SHIPPING. Perfect for that "Big Breakfast" or "Sunday Brunch". A whole 3 pound Taylor Pork Roll plus 3 pounds of Genuine Habbersett Scrapple. 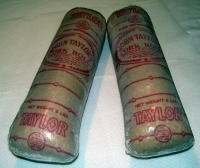 12 pounds of Genuine Taylor Pork Roll - This is the real thing! Price includes shipping. 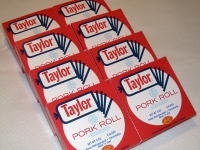 12 individual packages of Taylor Pork Roll that's already sliced. Please note that this package is shipped via UPS or USPS Priority Mail depending on the destination. A Hearty Salami in the European Tradition. Landjaeger Smoke Flavored Hunter's Snacks are the perfect anytime snack. 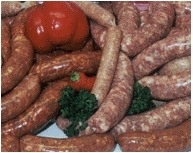 Genuine Maglio's Italian sausage made right here in South Philly. Choose either hot or mild. Delivery via FedEx express. An box containing 6 pounds of Pork Roll. Great for pork roll, egg & cheese sandwich.